The Dupray ONE Steam Cleaner with the complete accessory kit is a compact canister-type model that can be rolled around to refresh hard floors, furniture, and other trouble spots. The various accessories will let you handle a variety of jobs in the house or garage. Refreshing hard floors and furniture need not be a chore with the right tools on hand. Homeowners have learned to tidy up stained and grimy spots around the home with steam cleaners. These machines can also be used on stone, ceramic, glass and other sealed, hard-surfaced materials. Steam cleaning is good for maintaining wet and heavily-used areas without the use of vacuums or toxic chemicals. Steamers are designed quickly turn water into steam then flow the pressurized streams through hoses. Parents prefer this method due to its capacity to cleanse bathroom and kitchen areas in ways that are kid-safe. Product Description: Experience sparkling results with the Dupray ONE steam cleaner: the most simple and efficient solution for chemical-free cleaning. Entirely made in Europe, this steam cleaner turns regular tap water into a precise cleaning and sanitation tool. Dupray’s warranty and replacement policy is second to none. Forceful steam readily dislodges most stains and gunk and eliminates 99% of all germs. Hard surfaces are readily and safely cleared and sanitized by the output stream, which is highly effective at killing bed bugs. Many cleaning tasks are made easier, such as clearing greasy kitchen counters and removing grout stains from tiled bath floors. Dark spots on tiles that can be tricky to remove with a hand brush are easily cleared using high-pressure jets of steam. Light steam cleaning works nicely on light-colored walls and like areas. The technique is also good for wet areas, particularly in showers, kitchens, and appliance interiors. It may be necessary to apply a heavier flow to handle embedded muck, though. Looking for a lower cost option? Check out the Dupray Neat. If you want a commercial grade steamer for the home, check out the Dupray Tosca. Some types of laminate floorboards can be carefully steamed using mop attachments made for the purpose. Laminates will endure occasional spills, but the left-over moisture that seeps through into the internal layers can cause damage in the long run. In operation, the contents of the boiler pressurize at 4 times the atmospheric level. This raises the boiling point while water is heated to 303˚F, producing superheated ‘dry-vapor’. A water-level gauge conveniently indicates when a refill is in order. The ready signal and thermal auto-shutoff are features not usually found in this price range. The base weighs around 11 lbs. and is easier to wheel around than larger canister models. The long length of the power cord combined with the extended hose all combine to make it easier to reach every corner of a large room. A full range of attachments comes with the unit, including 2 extension hoses, nozzle and connector, rectangular mop tool, triangular floor tool, window tool, plunger, 2 microfiber pads, 2 nylon and 1 brass utility brushes, and a funnel. As boilers can degrade in performance over time due to issues with uneven assembly, it is usually a good idea to look for reputable brands with long warranties, and this model comes with a generous three years from the manufacturer. The unit only needs some 8 minutes to produce highly-pressured steam, which is faster than larger steamers. Continuous steam output over 40-50 minutes is possible with controls adjusted for a light flow. Pressure can be varied without continually engaging switches. It is recommended to start with low settings before slowly increasing output, adjusting the stream to match conditions. Users are also advised not to fill the tank to the brim, as overfilling will not allow enough interior volume for expanding vapors. The corner brush with its padded microfiber ‘bonnet’ is good for rubbing off stained areas in fabrics until they eventually fade away. However, the supplied mop padding or ‘bonnet’ is not much better than those of rival models. Be aware that the hose extensions are not designed to bear much weight before yielding. A higher-capacity boiler would have enabled longer cleaning sessions between refills. Things must also cool down prior to opening and refill the reservoir, after which you must pause again as steam is produced once more. 1400-Watt boiler element outputs at high temperatures near 303˚F. Superheated low-moisture steam is best for refreshing most furniture and laminate flooring. Low-profile wheeled canister design weighs about 11 pounds. Decent reservoir capacity of 39 ounces means more time can be spent cleaning instead of refilling. Variable and continuous-flow controls allow for flexible steaming under various conditions. Low-water and ready indicators are convenient for checking operating status. Automatic overheating shut-off and childproof lock features provide for safer operation. Useful attachments allow users to configure the unit for various tasks. Long 6-foot output hose gets to every nook and cranny. Extended 16-foot power cord reaches back to most outlets in larger areas. Generous 3-year warranty offers peace of mind. Comments like “No Chemicals, very user-friendly!” attest to the greener applications that are possible with steaming. Many found the low-water and ready indicators to be convenient for signaling readiness. Many users like that dry-vapor output can be safer for cleaning wood furniture and laminate floors, i.e. “Dupray’s dry steam cleans without soaking.” Some note that the moister steam produced by less sophisticated steamers tends to result in soaking finishes. With the water reservoir filled to near capacity and the heater turned on, the steamer will be ready in under ten minutes or so. Filled up, it usually produces 40 minutes or more of continuous steaming, which can be prolonged with economical adjustments to the variable-flow control. The Dupray ONE draws mostly four-to-five star reviews on the big online sites like Amazon. It has many favorable reviews and is usually offered with free shipping. This steamer might not offer the largest capacity in the market, but it is effective at most jobs and scores quite well for ease of use as well as dry-vapor capability. This is a nicely-designed model, but buyers did find a minor issue or two. The 39-ounce boiler offers less capacity than is typical in this class. Some users also took care not to handle the extended plastic hose too roughly. Still, the unit is still capable of up to 50 minutes of nonstop steaming, with a light touch on the controls. We think that its capacity to safely refresh the looks of furniture and laminate flooring more than compensates for the middling water volume. Dupray’s One Steam Cleaner is a robust and easy-to-use ‘dry steam’ cleaner that performs well in most jobs and is particularly good at refreshing fabric upholstery. See what customers are saying! Read verified reviews here. 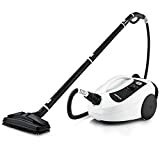 The Dupray One Steam Cleaner with the Complete Accessory Kit model is reliable and effective while being nicer to operate than competing designs. A larger boiler would have enabled longer nonstop steaming, but the tank is easily replenished just the same. This is one of the few models that produce effective dry-vapor steam, so you can take advantage of its superheated output wherever appropriate, such as with fabrics and furniture. The extreme heat generated works to eradicate lurking bed bugs faster as well. The on-demand and flow controls are easy to use and will help you to adapt output as needed. The range of clever attachments will enable any household steaming job to be done right. A generous 3-year warranty enhances what is already a very competent household steamer. Up to 50 minutes of cleaning time per fill up. QUALITY ACCESSORIES : 16-piece kit. POWERFUL STEAM: up to 303°F with ADJUSTABLE PRESSURE. WARRANTY: 3 years / Lifetime on stainless steel boiler.